"The Best Man Wins," by K.J. 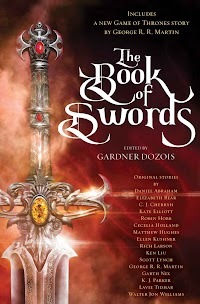 Parker [bio] (edited by Gardner Dozois), appeared in The Book of Swords (RSR review), published on October 10, 2017 by Bantam Books. Pro: The descriptions of sword making and training are interesting in their own right. The lead up to the final fight is tense, as we gradually realize whom the young man intends to fight. It’s hard to believe that one can acquire that much skill at swordsmanship that quickly. The details about making and using swords go on for too long.